25 years ago today I became the Youth Pastor at New Covenant, but it’s a miracle that I did. The odds were against me all the way. Very few of you know the story I’m about to tell. 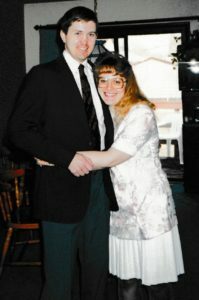 But before I do, I have to show a picture of what Cindy and I looked like back in 1992. We were 28. We were young and in love. Now we’re just old and in love! And we have less hair! Here’s the story. For six years I had been serving as “Director of Christian Education and Youth” at a Baptist church in our hometown of Rockford, Illinois, when one day — out of the blue — I got a phone call from some guy in Iowa. He said his name was Dave Sanders, that he was on a search committee, and that my name had been recommended to him by Jay Jentink (a former classmate of mine from Moody Bible Institute.) They were looking for a full-time Youth Pastor! To put this in perspective, this NEVER happens. This was my dream job, but I hadn’t really told anyone about that dream. I wasn’t looking to change jobs — I didn’t even have a resume! From Dave’s description, New Covenant was a healthy, non-denominational church that made youth ministry a top priority. It sounded like a perfect fit for me! I didn’t even wait to tell Cindy the good news! Instead I turned it down. As much as I wanted to say yes to this exciting opportunity, I knew that I had to decline it. In recent months Cindy and I had become very upset with things that were going on in our church, particularly how certain people that we loved were being mistreated (in our view) by a handful of adults. We dreaded going to church to be around these “mean people.” Somehow, I knew that to leave our church at that point would be running from our problems — and that we would always regret that. I knew that God wasn’t releasing me. So I hung up with Dave Sanders, knowing that I had just passed up a rare opportunity. Remaining stuck with these people and losing our potential escape from them made us doubly miserable. Recognizing our need for sympathy, we drove to Chicago to unload our woes on my best friend and mentor, Brian Carroll, and his wife Liz. We vented for hours about the way we were surrounded by gossipy, negative, unloving, grumpy, back-stabbing people. When we were done Brian quietly said eight words that changed our lives forever. “It sounds like you’ve become just like them.” Ouch. It was a knife to our hearts, but we knew he was right. He challenged us to give up our bitterness and instead choose joy, to love those we considered unlovely, to be Jesus to everyone. It was like a switch in our souls was flipped. In an instant our attitude changed from incredulity to love. Instead of dreading church and going out of our way to avoid certain people we decided to make it our mission to gravitate toward them and treat them with kindness. Starting that Sunday, church was suddenly a delight for us. We stopped focusing on people’s shortfalls and started focusing on our responsibility to love them. We saw that these were good people and that the log in our eyes was bigger than the speck in theirs. Our attitude was completely transformed. I was even prompted by God to personally apologize to each of the people I had harbored bitterness toward — an apology not for my actions, but for my attitude toward them. One day — about a month later — I told God that I would be willing to work alongside them for the rest of my life. A miracle! To put this in perspective, this NEVER, NEVER happens. Because we had resolved our bitterness with our church we knew that God had released to pursue this new opportunity. I put together a resume and the interview process quickly confirmed that God’s had brought this about. We left that church on good terms with everyone and consider many of them dear friends to this day. So God brought us to Iowa! Little did we know that my ministry here would last 25 years! As I blogged about last year this church has meant so much to me and my family! God has certainly been good to us! I have nine months left as youth pastor before leaving to pursue my new career in counseling and a new chapter in my life, but I will always be thankful for our 25 years at New Covenant and how God brought it all about so long ago!